Me like many others eagerly awaited every Thursday night to see what new beauty drama would pop off on WeTv’s reality show, “L.A. Hair”. One standout character in particular, that joined the cast this season, was Ms. Naja Rickette. I personally loved Ms. Rickette’s snazzy personality, gorgeous nail techniques and her oh so cute blazers that she often wore. 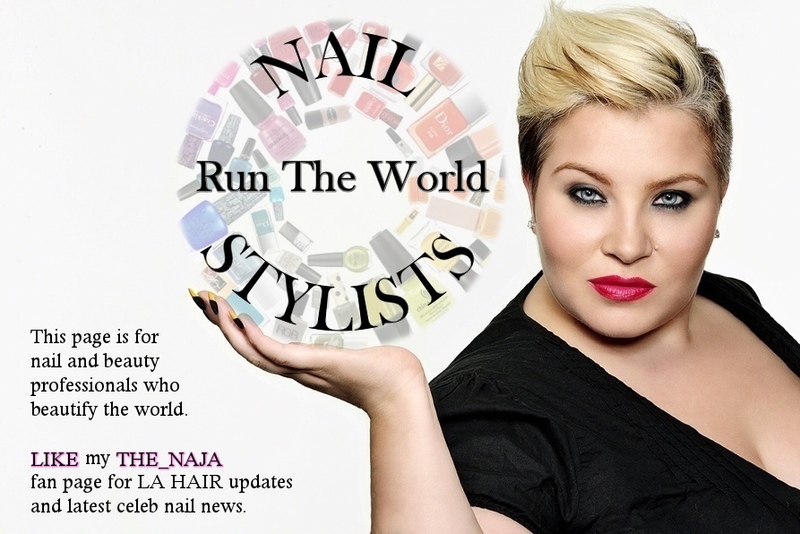 Naja Rickette is a nail stylist from the mean streets of New Jersey. Since the age of 13, Naja has been working and taking care of herself. Naja was a chef before she was a nail artist, so she knows what presentation is all about. Naja is the undisputed master at creating high end nail art not seen before by anyone. One of her proudest moments was in styling Fergie’s (Black Eyed Peas) nails for one of their most famous videos “Boom, Boom, Boom” in which she created really long, sharp looking nails with a metallic/sliver and black stripes which Fergie used in the video and on tour. She has also designed the nail look for Paris Fashion Week. Naja has been creating couture nails since 2003, and it was around 2007 when she came across Kim Kimble on set while styling Mary J. Blige’s nails. Kim was impressed with Naja’s hustling attitude and took Naja under her wing and taught her a couple things about onset etiquette. How did you get a niche to become a nail tech? I didn’t. I just fell into it. After high school I went to culinary school and worked as a chef for 6yrs. I decided it was time to change careers and start to explore the world. I moved from NJ to LA with $300 and a new haircut to find a new career. I did not know what it was going to be BUT had one stipulation: that I could wear my own clothes. I was trapped in a uniform my whole life. I went to catholic school my entire schooling, then culinary school, then worked as a chef in that horrible chef outfit. UGH! My first job in LA was the front desk at a day spa. I fell in love with the whole spa business and a few years later was a manicurist at that spa. What has been your most difficult technique to do thus far in your career? What new nail techniques are you working on now? How did you come about being on the newest season of “LA Hair”? I worked with Kim Kimble for a number of years with clients like Mary J. Blige and Eve. She and her mom always came to my salon to get their nails done and even bought gift certificates for her employees for my salon. When she expanded her salon she called me and ask me about running the nail department. Is it really that much drama in the salon amongst the stylists or is it hyped up a little for TV? China truly does not like Angela. Anthony is annoying to everyone- especially professional people that are at a salon to work!!! I think beauty salon and gossip/drama go hand & hand. The drama and shade is real. Who are some of your favorite celebs to work with? I’ve noticed your snazzy fashion style on TV and I think that you represent the curvy community well. I just love how you wear blazers. Who are some of your favorite designers or trends to wear? Thank you. I really got into a blazer craze with light weight shirts underneath usually with a pop of color. To be honest I do not know that many designers in the curvy community at this point. I’d like to be exposed to more. For now, I get 95% of my clothes at Forever XXI. I think they are right on trend and love that they have fashionable choices in plus sizes. I see that you’re the co-owner of “Nail Talk Radio”, can you give us a little more info on that please? It is a weekly online radio show about all things nails catering to the professional nail community. We’ve been doing it for 3yrs now and our listeners has grown immensely. We given away 45K + in nail product prizes and uplift, support, educate & motivate the nail artists. It is a great community and such a fun show to be part of. What are you plans for the near future? Will you return to the show next season? If there is a season 3, most likely yes I will be there. I’m working on conducting a few online classes for nail professionals. I’d love to write a book on the business side of things geared to the artists- especially in the beauty industry. Get more involved in the curvy community because it was not something I thought about or expected but the amount of email and social media love I get from curvy women all over the world has really impacted me- so I would love to be as helpful as possible by sharing myself in a way that can make the biggest difference.